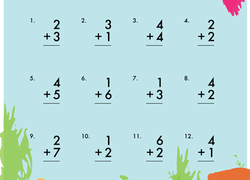 Drilling down mental maths skills is anything but dull with these addition drill worksheets. Go fishing, play basketball, celebrate holidays, and more--practising addition has never been more fun! Addition and building go hand in hand. Show your little maths whiz the basics of addition with this picture maths worksheet. It's a beach themed addition party, and your kindergartener is invited! She'll practise single digit addition with fun and familiar beach items. Is your little explorer reading for some addition practise? He'll use single digit addition to add items familiar to any outdoor adventurer. Get your first grader started on learning his addition facts with this maths worksheet offering beginning addition problems with sums up to 9. Make maths practise fun with some baseball addition! Your child will get to practise his addition facts (simple one-digit addition problems). 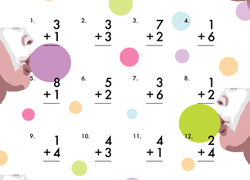 Boost your child's arithmetic skill and addition facts fluency with this bubbly worksheet that offers single-digit addition problems with sums of 9 or less. Stay sharp this spring season with an addition Easter egg hunt! Your child will practise her addition facts, simple one-digit addition problems. 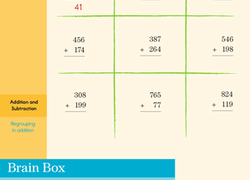 Assess your students’ understanding of addition by having them solve addition problems within 20. Give your child an introduction to addition with help from this easy addition worksheet. She'll draw more of each item, then count them up to find the total. Race to learn addition with this fun picture addition worksheet. Kids will count the vehicles to solve each picture equation. Get your maths gloves on, it's time for construction addition!